Only TIDELOG shows you what’s really going on! 1) We bring the numbers to life. At a glance! 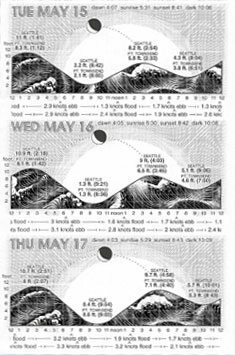 The official National Oceanic and Atmospheric Administration (“NOAA”) and United States Naval Observatory (“USNO”) predictions specific to each geographical area are graphed to give you a visual picture of each day’s conditions… at a glance! 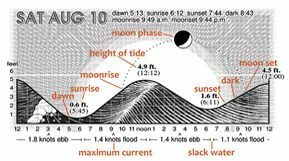 2) Tide and current information is presented in the context of the sun and moon. This helps you make real-world assessments of the conditions you’ll face. For example, “the current ebbs all afternoon; low tide is just after dark; there will be no moonlight until late… so we’ll want to be in by about 6 to be sure we clear the shoals (remember that other time?) and still have enough light to see.” Other tide books lack this information. 3) Easy to use. No confusing data to interpret. Everyone makes them. We’ve seen even old hands misread a “baitshop” tidebook: “Oh, I was reading the a.m. column and thought it was p.m.!” Tidelog’s graphics make it hard to go wrong. Tidelog is favored not only among recreational boaters, but also by commercial, scientific and industrial users. Repeat customers include many of the big names in shipping, tugboat, piloting, engineering, construction, flood control, pollution control, aquaculture, police, harbormaster and other maritime professions. Tidelogs are used to combat whale strandings on Cape Cod, to predict geothermal activity in California, to harvest geoducks in Washington state, locate fossils in Chesapeake Bay and to plan kayaking trips on Tybee Island. Built to last and survive heavy usage. Nice, gold-imprinted cover. Permanent, lay-flat binding. We know you’ll love the Tidelog! If for any reason you don’t, just return it within 30 days for a courteous refund. TIDELOG shows you what’s going on!